Although born in the landlocked country of Hungary in Budapest, Dr Csilla Ari fell in love with the sea as a child and has never looked back. Today, she is a research associate at the University of South Florida, where she strives to better understand the biology and behavior of manta rays. 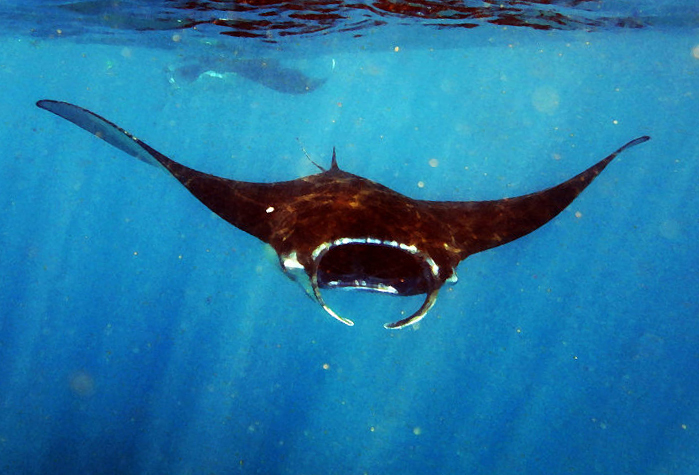 She has also set up the Manta Memories project, which aims to help end illegal manta ray fishing. Young manta ray approaching at the surface, Indonesia, Nusa Penida. Photo courtesy of Dr Csilla Ari. But growing up in Hungary, a landlocked country, I did not have much option to pursue my dream as a marine biologist, so I got my master's degree in zoology and my doctorate in neurobiology, while volunteering at oceanography institutes in different countries during the summers. During my PhD studies, I worked on the neuroanatomy and neurohistology of several shark and ray species, including mobulids (mantas and mobulas). During these years, I had the chance to explore the brain structures of mantas and mobulas, which reflected some very unique and surprising features. It was the unusual enlargement of some of their brain parts that got me interested in focusing on their behavior. X-RAY MAG: What approach did you take to your research? CA: The first interesting and somewhat surprising fact is that manta rays have the largest brain of all fish species studied so far. Their brain is many times larger than other plankton feeder sharks or cartilaginous fishes with a similar or even larger body size. I believe that evolution must have had a very good reason to develop such a large brain and I was extremely curious to find out what it was. In addition, the forebrain, the part of the brain considered to be responsible for learning, memory and sensory integration, is especially enlarged in mobulids. Actually, they have the largest forebrain of all batoids, leaving all other batoids far behind. Other areas, those that imply highly developed social behavior in other animals, were greatly enlarged as well. These and some other unique features caught my attention and I started to look for ways to test their sensory and cognitive abilities, as well as their social behavior. I had gained experience with manta rays in the wild in several countries by then, and I realized that answering my questions in the wild would be challenging. Some of the conventional methods that are being used to test visual and cognitive abilities are technically impossible to conduct in the wild, so I started experiments in a more controlled environment on captive animals. There are no easy ways to test these on manta rays, but I found a widely-used and well-established test that can give us insight on their cognitive abilities. The mirror self-recognition (MSR) test is considered to be a reliable behavioral index to show the animal's ability for self-recognition/self-awareness. Recognizing oneself in a mirror is a very rare capacity among animals. Only a few, large-brained species have passed this test so far, including Asian elephants, bottlenose dolphins and great apes, but no fish species so far. So, employing a protocol adapted from primates and bottlenose dolphin MSR studies, I exposed captive manta rays to a large mirror and recorded their behavior. 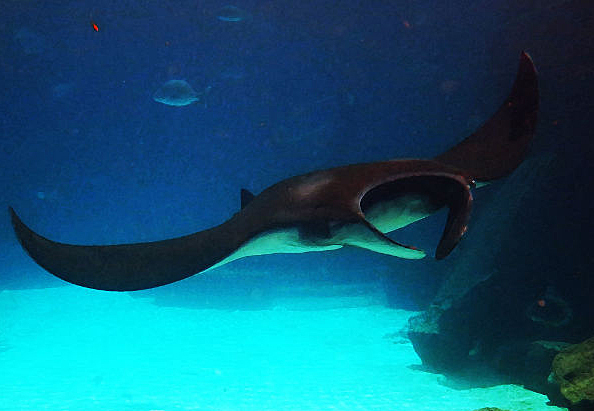 The manta rays showed significantly higher frequency of repetitive behavior, such as circling at the mirror or high frequency cephalic fin movements when the mirror was placed in the tank. Contingency checking and self-directed behavior included body turns into a vertical direction, exposing the ventral side of the body to the mirror while staying visually oriented to the mirror. Most surprisingly, such self-directed behaviors were sometimes accompanied with bubble blowing front of the mirror and sharp downward swims. In apes, similar repetitive and unusual, self-directed behaviors in response to a mirror has been taken as evidence of self-recognition, so the recorded observations on manta rays possibly indicate self-awareness. Further tests are needed to confirm this theory. X-RAY MAG: Do you have other examples of cognitive behavior? CA: Those who have been fortunate enough to dive or snorkel with manta rays say that it is a very special experience and there is a special connection when these animals approach you. Many believe that they are capable of recognizing people and conspecifics, even after a long time period. They show interest and curiosity, they often voluntarily approach humans for no obvious reason, or even to 'ask for help' when they get entangled in fishing lines. It has happened to me multiple times while snorkeling with wild and also with the captive mantas, that they swam under me, repeatedly, many times, then slowed down and slowly, very gently lifted me up, almost completely out of the water for a few seconds. Then they slowly swam away. I strongly believe that they have well developed social behavior and communication. My recent discovery also shows how little we know about them: I documented and reported that they are able to change the intensity of coloration of certain patterns on their back within minutes, which might be a new form of communication. These findings were also highlighted in the prestigious Nature scientific journal. I believe they have many more secrets waiting to be discovered and/or understood by us. X-RAY MAG: What does this mean for our understanding of these important marine animals? awareness, which implies higher order brain function, as well as sophisticated cognitive and social skills. Those species with elaborate brains that passed the MSR test to date have large, complex and highly foliated brains, complex social behavior, cooperative behavior, and the ability to feel empathy. If manta rays are among the few species that are self aware, we might be able to conclude that they also share the same common characteristics and are capable of complex social understanding, cooperative, and empathetic behavior. Self-recognition is also essential for the ability to use their own experience to predict the behavior of conspecifics. This might be a unique ability of this fish species. However, these findings should be interpreted with caution because of the small sample size and because the MSR test might demonstrate only a specific level of a complex capacity of self-awareness. Our latest focus of research is their physiology, since they are perfectly adapted to extreme underwater environments. Their morphological and physiological adaptations could be exploited for extending human performance and resilience in extreme underwater environments. Mobulids are able to dive deep (~2000m), for long hours and their central nervous system is able to function well in extreme low temperatures, oxygen levels and under extremely high pressure. It turns out that they have high blood ketone levels, which are molecules known to function as alternative fuels if glucose is not available. We think that ketone utilization might be an important physiological adaptation to preserve brain metabolism in deep-diving animals with large brains, a phenomenon we plan to explore further in the future. 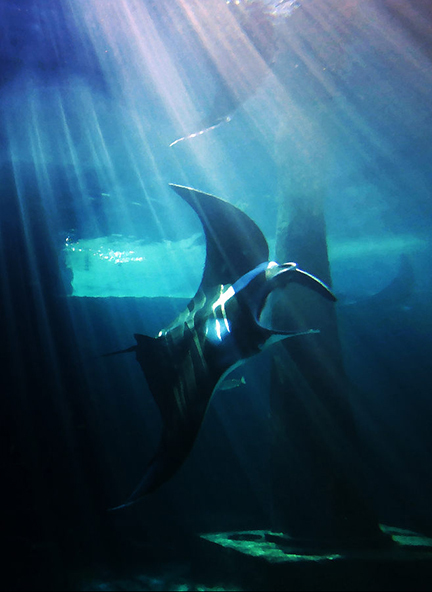 X-RAY MAG: What else would you like to share with us about manta rays? CA: Manta rays are fished illegally in many parts of the world. The concept of the Manta Memories project was born in 2012. In spite of legal protection, manta ray fishing and trade still happen worldwide and manta ray populations are being pushed to dangerous levels. Although many positive legal advancements have been taken in recent years to protect their populations, I believe that legal protection is not always enough. At some remote fishing villages in developing nations, people do not have alternative income options; they have no other choice but to fish for manta rays for their survival and to support their families. So, I decided to set up the Manta Memories project to help these communities to establish alternative income options, so they can give up on the illegal fishing and trade, without having to worry for their survival.